Hakan Sensoy conducted the concert in Istanbul, Zorlu perorfmance center Hakan Şensoy was born in Istanbul in 1968. He started his musical education at the Istanbul Technical University Traditional Turkish Music Conservatory in 1977 and graduated in 1988. Since 1984, he has performed many recitals and orchestral performances both in Turkey and abroad: England, Sweden, the United States, Italy, Mexico, Bulgaria, Romania, Poland, the Czech Republic, France, Estonia and Cyprus. In 1985, Şensoy was awarded the Most Successful Young Artist of the Year Award by the Istanbul Philharmonic Society, and the Great Performance in Art award by the rector of Istanbul Technical University. In 1988, Şensoy gave a recital at the Istanbul Atatürk Cultural Center to UNESCO representatives. In 1992, Şensoy received the fourth prize in the Rovere D′Oro Chamber Music Competition in San Bartalameo, Italy, and gave the opening concert for the International Christopher Columbus Festival in Bari. In 1993, he participated in the 21st International Istanbul Music Festival. In 1996, 1997 and 1999 he participated as a conductor in the International Young Musicians Festival of Istanbul. He has also participated in the Brasow International Chamber Music Festival in Romania, the Malmö Falsterbonasets Internationella Musikfestpel in Sweden, and the International Ankara Music Festival. In 1989, Şensoy completed postgraduate courses at the Royal College of Music in London. He completed his master′s degree n 1992 and completed his art doctorate at Istanbul Technical University Institution of Social Sciences in 2002. During 1992 - 1993 concert season, he led the Çukurova State Symphony Orchestra. He is currently the director of the Akbank Chamber Orchestra, the MR Chamber Orchestra, the Mersin Chamber Orchestra and the Cemal Resit Rey Symphony Orchestra. Şensoy has contributed to numerous radio and television programs as a guest and as a producer. He is a noted arranger of Yalçin Tura′s work, and has arranged three of his pieces: “Three Waltzes for Violin and Piano”, “Sonata for Violin and Piano”, and “Dance Tunes for Violin and 10 Chamber Soloists” as well as Münir Nurettin Beken′s “Dance for the Past for magnetic tape and violin" and “Holes on the Japanese Lamp for violin and cello". He premiered Miechel Ellison′s “Duet for Violin & Cello”. Hakan Şensoy has released three CDs: “The Eagien Balcanic Dances” with the kemençe (traditional Turkish instrument) player Ihsan Özgen; “Şensoy Plays Tura” and “İstanbulin” with Cihat Aşkın and Aşkın Ensemble. Yiorgos Kountouris conducted the premiere at the Vienna Concerthous in Vienna and Megaro Mousikis Thessaloniki Born in Nicosia, Yiorgos Kountouris graduated from the St. Petersburg State Conservatory, where he studied symphonic and operatic conducting with Prof. Alexander Alexeev and violin with Prof. Antonina Kazarena. In 2006, Mr. Kountouris was appointed at the University of California, Los Angeles as the assistant conductor of the UCLA Philharmonia and UCLA Symphony orchestras. He has conducted numerous orchestras in Europe, the U.S.A and Russia. Some indicative collaborations of the maestro include the St. Petersburg Philharmonic Orchestra, the Vienna Chamber Orchestra, the Hermitage State Chamber Orchestra, the Athens Camerata as well as the prestigious Lege Artis and Wiener Singakademie choirs. Yiorgos Kountouris has been the first Cypriot conductor appearing in some of the world's most historic music halls such as the Wiener Konzerthaus, the St. Petersburg Philharmonic Hall and Royce Hall in Los Angeles. He had his Cyprus début in June 2008 with the Cyprus Symphony Orchestra, which was followed by a tour in Greece with the final concert in Athens Megaron. Since then, the collaboration with the CySO continues on a regular basis. In May 2010 he opened the "Karelian White Nights" festival with the Karelian Philharmonic Orchestra while in 2012, Y. Kountouris conducted the Cyprus premiere of I. Xenakis "Oresteia" at the closing concert of the International Kypria Festival. ECM released in 2012 a recording of Y. Koumentakis's 3rd piano concerto, with Y. Kountouris conducting the Athens Camerata at the Megaron Hall; soloist - Y. Lazarides. Y. Kountouris teaches Conducting at the European University of Cyprus. His research papers were published in Greek, English and Russian languages in some of the most esteemed international musicological journals such as the "Moscow Musical Academy". Since January 2013, Mr. Kountouris is the artistic director and condutor of the Cyprus Youth Symphony Orchestra. Stefan Vladar conducted the concert at the Philhamonie Munich Vladar’s international career has taken him to the world’s major music venues. He has performed under the baton of Claudio Abbado, Riccardo Chailly, Christoph von Dohnányi, Vladimir Fedoseyev, Daniel Harding, Christopher Hogwood, Louis Langrée, Sir Neville Marriner, Lord Yehudi Menuhin, Seiji Ozawa, Horst Stein, Christian Thielemann and Sándor Végh in appearances with the Academy of Saint Martin in the Fields, Bayerisches Staatsorchester, Royal Concertgebouw Orchestra, Chamber Orchestra of Europe, Chicago Symphony Orchestra, NHK Symphony Orchestra of Tokyo, Rotterdam Philharmonic Orchestra, Tonhalle-Orchester Zürich, Vienna Philharmonic Orchestra and Vienna Symphony, among many others. Since 1991 Stefan Vladar has devoted himself increasingly to conducting, appearing with such orchestras as the Vienna Symphony Orchestra, Mozarteumorchester Salzburg, Camerata Salzburg, Bruckner Orchester Linz, The Hague Philharmonic, Essen Philharmonic, Stuttgart Philharmonic, RSO Budapest, Danish Radio Symphony Orchestra, Haydn Orchestra of Bolzano and Trento as well as the chamber orchestras of Prague, Cologne, Zurich, Basel and Ireland. Stefan Vladar is in a variety of capacities as a soloist, chamber-music partner and conductor a highly esteemed guest artist at the world’s most prestigious festivals, performing at the Salzburger Festspiele, the Festivals in Edinburgh, Osaka and Hong Kong as well as the Rheingau Musik Festival, the Schleswig-Holstein Musik Festival, the Klavierfestival Ruhr, the Musikfest Bremen and the Schubertiade Schwarzenberg. In May 2010 he was the artist in residence of the German Bodenseefestival, with numerous concerts both as conductor and pianist, also conducting the opening concert with the Bamberger Symphoniker. Stefan Vladar has been the principal director of the newly founded Recreation – Grosses Orchester Graz from 2002-2006. In May 2008 he was named artistic director and principal conductor of the Vienna Chamber Orchestra, following Heinrich Schiff in this position. Among the internationally renowned chamber-music artists with whom Stefan Vladar regularly performs are the Ensemble WienBerlin, the Artis Quartet, Heinrich Schiff, Julian Rachlin, Janine Jansen, Clemens Hagen as well as the singers Angelika Kirchschlager and Bo Skovhus. Stefan Vladar is the artistic director of the festivals in Neuberg and of the Upper Austrian Monastery Concerts, one of Austria’s most important festivals. In 1999 he was appointed to a professorship in piano at the University of Music and Performing Arts in Vienna. Vladar’s discography includes more than 30 releases for labels such as harmonia mundi, Sony Classical and Preiser-Records with his own series “Classic Selection” documenting his work as a pianist and as a conductor with music amongst others of Haydn, Schubert, Schumann, Chopin, Prokofiev and Scriabin. In 2009 he received the Decoration of Honour in Gold for Services to the Republic of Austria. The “Kavafis Project” is an elemental work, which combines the wisdom of philosophy with the intuition of music. 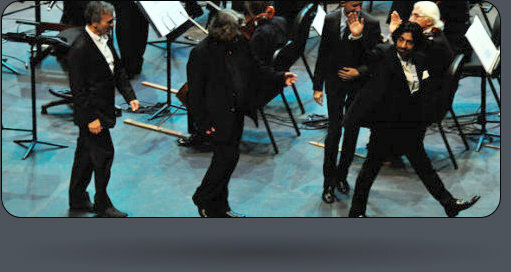 Conducted by Hakan Sensoy, Stefan Vladar and Yiorgos Kountouris.